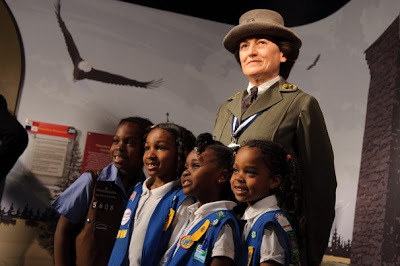 The Washington Post reports that to honor the 100th anniversary of the founding of the Girl Scouts of the USA, Madame Tussauds wax museum in Washington has added a figure of the group’s founder, Juliette Gordon Low. Dozens of Washington-area Girl Scout Daisies went to the museum Wednesday morning for the unveiling of the lifelike figure of Low, who started the scouting organization on March 12, 1912. The unveilng is one of several events celebrating the anniversary. A concert on the Mall called “Girl Scouts Rock the Mall: 100th Anniversary Singalong” will be on June 9. More than 200,000 people are expected to attend. Low, who was known as Daisy, started the Girl Scouts in Georgia; there were 18 members at the first meeting. Today, there are more than 3 million active Girl Scouts, and more than 50 million women have been members. Famous former Girl Scouts include actress Dakota Fanning, tennis star Venus Williams and Secretary of State Hillary Clinton.